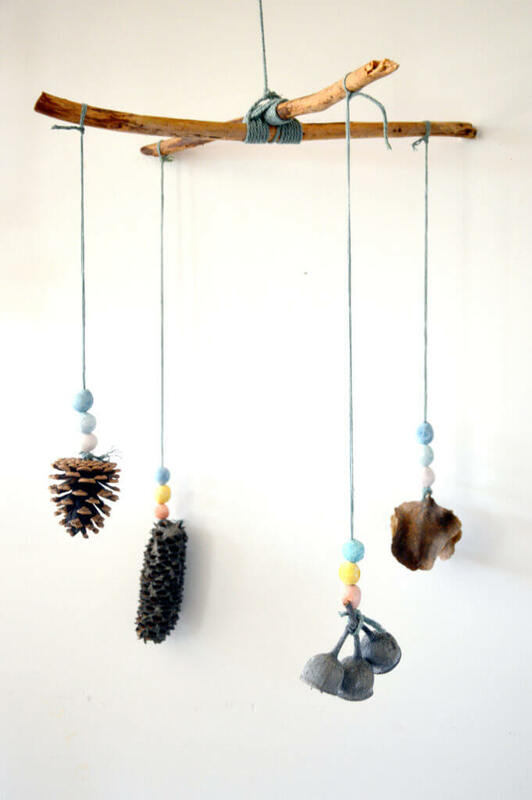 Go for a nature walk and gather natural materials to use for this beautiful nature mobile. Painted air dry clay beads add the finishing touch! Nature based art project and post by Abbey Donald of Wild Wattle Folk. Children are naturally drawn to nature, especially preschoolers. If your little ones are anything like mine, it’s not rare for a quick walk to the park to see us coming home with heavy pockets filled with rocks, sticks, leaves and any other piece of nature the kids found along the way. On the days when we go on nature walks my bag is usually filled with seed pods, fallen bark and branches. You name it, and it’s probably made its way back into our home. The hard part isn’t collecting. But figuring out what to do with all this newly found natural treasure can be a difficult task. This nature mobile is the perfect way to not only create something, but also to hang up and show some of the treasured items we collect. First, make your clay beads as these will take a little while to dry. If you are using ready-made beads please head straight to Step 4. Take a teaspoon-sized piece of air dry clay and roll it into a little ball. Make as many balls as you would like beads for your mobile. We made twelve in total, three for each side of the mobile. Now take each little clay ball and using a skewer or small stick, poke a hole from one side straight through to the other to make a little clay bead. Set them aside on a tray or dish to dry and harden. We find the best place for ours to dry is on a well-lit, sunny windowsill. Once your clay beads are dry, begin painting them any color your little folk choose and set aside again to dry. I like to make some clay beads prior to doing this activity so that the kids can set those aside to dry and continue straight on if they choose to. Then we can use the others they made for a range of things like necklaces or suncatchers. Take your cord and cut off roughly five feet. Take one end and create a small hook for your mobile to hang off and knot it together (approximately two fingers in width will do). Taking your two sticks, place them side by side about six inches from the loop end of your cord and tie the cord around the two of them. Turn your two sticks so they are now making an X shape. Begin wrapping the cord over the top of one of the sticks, moving over and under and back over the top to the next stick in a clockwise pattern similar to when you are creating an Ojo de Dios. Continue using up all the cord and tie it off in a double knot. One by one take a piece of your chosen nature treasure and tie one end of a piece of twelve inch cord to each. If your nature treasure doesn’t have an easy place to tie the cord, you can always glue the cord to it, as we did with the pinecone in ours. Now take your painted clay beads which should be dry and thread them on to each piece of cord holding the nature treasure. Once you’re happy with the amount of beads on each, you can tie them to your nature mobile frame. This is the tricky part as you will want to try to evenly distribute the weight of each so your mobile stays as even as possible once hung. Now that your nature mobile is complete, you can get your little wild folk to choose a place to hang it and be inspired each time they pass by it! Abbey Donald is a home educator and the creator behind Wild Wattle Folk, a website dedicated to connecting children with the natural world and its seasonal rhythms with a range of nature-based craft and learning activities. These activities have free tutorials, some of which are used for West Melbourne Wildlings, a non-profit, homeschool pre-school co-op which Abbey founded to help families in the area connect, support and grow into a village. Abbey believes children have a birthright to be in nature when they choose and as frequently as possible. She draws educational inspiration from the Reggio Emilia approach where children are considered “knowledge bearers” and should be given endless ways and opportunities to express themselves. Previous Post Make Cardboard Robot Puppets that Move! Next Post Try This Bath Mat Printmaking Activity for Kids & Create Abstract Art Prints!